"Anime, action and samba, what's not to love?" Part 2 of the Michiko and Hatchin boxsets focuses on the second half of the anime series, episodes 12 to 22 and continues the high standards of the first part of the series, even though there are a few filler episodes. 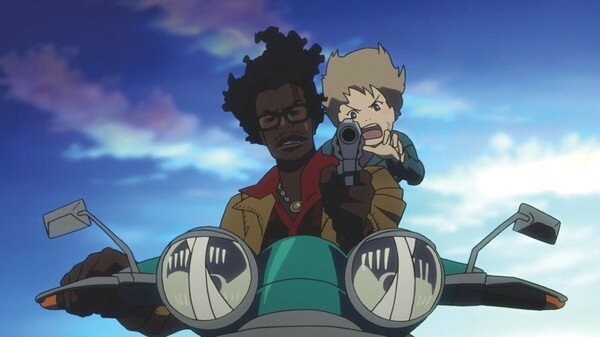 Part 2 picks up where Part 1 left off, Michiko and Hatchin are reunited and continuing on their journey to find Hiroshi Morenos, Hatchin's father. But their journey is complicated by the police constantly chasing the pair, the mother and daughter getting caught up in a gang war between Satoshi Batista and his former lieutenant Shinsuke and Hiroshi constantly moving from city to city. Like the first part of the series Part 2 continues the high standards of animation, action, music and drama and comedy. The animators get to experiment with many different art-styles, episode 12 having a psychedelic look at a delirious Michiko suffering from a fever, a coastal town having a picturesque water color look and dark visuals for a oriental influenced city and a ghost town. The locales used are mostly influenced by Brazil, from slums and urban poverty, the aforementioned coastal towns and a modern city with a skyline of skyscrapers. Whilst the country in the series is set in mostly Brazil, other Latin American cultures are used, episode 13 is set in tourist town near Aztec ruins and one crime filled city that is a mix of Brazilian slums and various oriental culture in squalor, having crack babies lying in the streets. 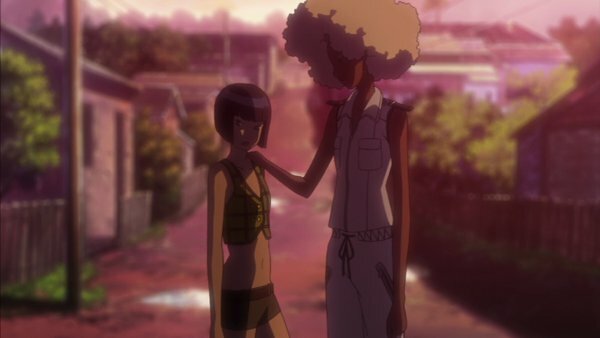 The relationship between Michiko and Hatchin has moved on from the bickering and distrust and they are more attached to each other. They still fall into conflict with each other on occasion, but the pair now see how important they are to each other with Hatchin wanting to make Michiko happy and resorting to hope when searching for Hiroshi. Hatchin becomes a stronger character due to having time with Michiko, being more willing to throw herself into danger and being willing to stand up for herself. In episode 17 Hatchin was in the care of a young character who was as abusive as her foster brother and sister and she does not take the abuse. Instead, the second half of the series has a theme of divided loyalties and breaking friendships, Atsuko being torn by her duties as a police officer and old friendship with Michiko, trying to find a middle ground and the gangsters Batista and Shinsuke going to war with each other with the episode 20 showing their past in a ghost town. Michiko suffers from having a hopeful vision about an ex-lover despite people around seeing that she is blind to reality. The second half of the series does meander more than the first half with episodes being more individual affairs. Case in point, is episode 15 where Hatchin being the center of attraction for a young boy which on the whole does not play a part in the wider story. But even when the series does take these diversions, these episodes still focus on character development or has a small moment that links to the wider narrative. The voice acting is still of a high standard in both Japanese and English and due to Latin American setting the series is very accessible for Western audiences and audiences who are not so interested in anime. It is a series filled with excellent action and animation and funky music.